Last fall, Dr. Thomas Tubon and I presented a Bio-Link webinar on Genome Engineering with CRISPR-Cas9. Since my part will be to help our audience understand the basics of this system, I prepared a short tutorial with Molecule World . Enjoy! 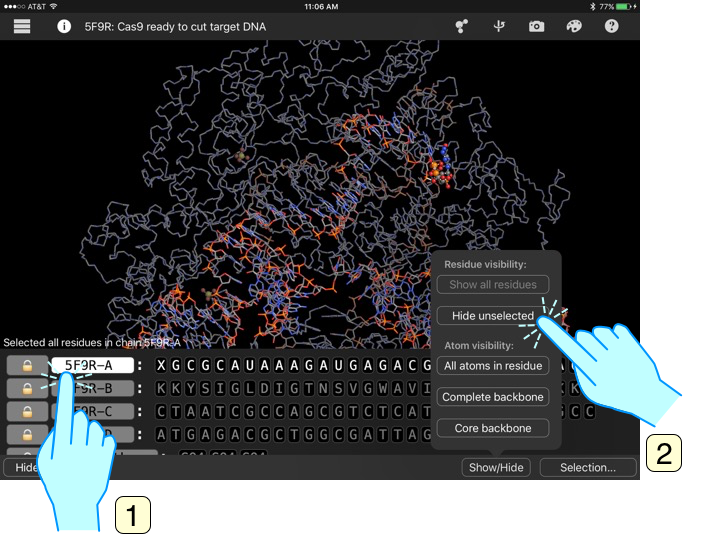 Go to the Digital World Biology CRISPR Structure Collection. Download the second item in the list, 5F9R, by clicking the link in the Download structure column. 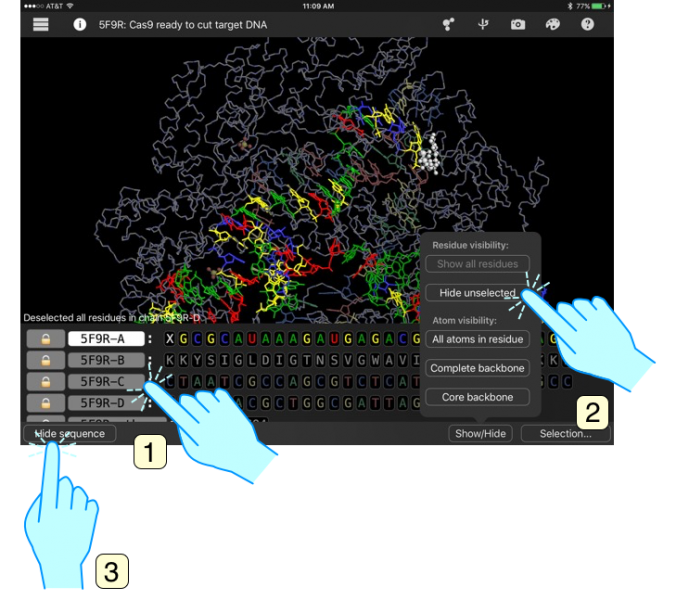 Identify the three components of the CRISPR - Cas system: The Cas9 protein, the guide RNA, and the target DNA. 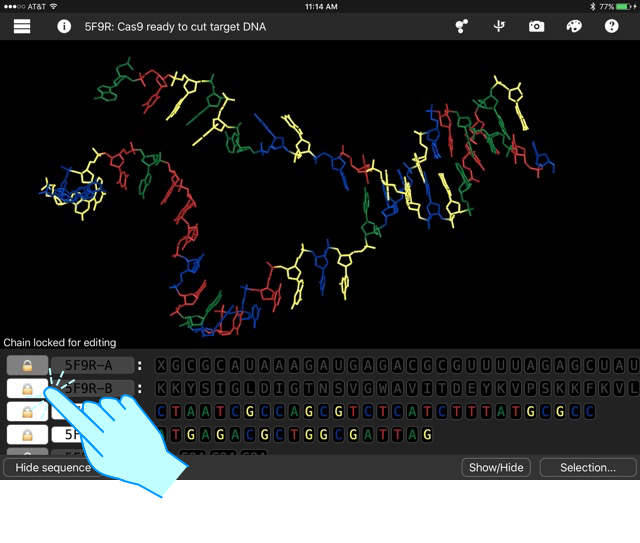 Use the camera button to capture an image of each component and paste it in your lab notebook. To view the individual components, find and highlight the different kinds of sequences one at a time. Use a combination of hiding structures and changing the coloring and drawing styles to make it easier to distinguish the parts. You may want to zoom in and zoom out to see how the nucleic acids are positioned within the protein. 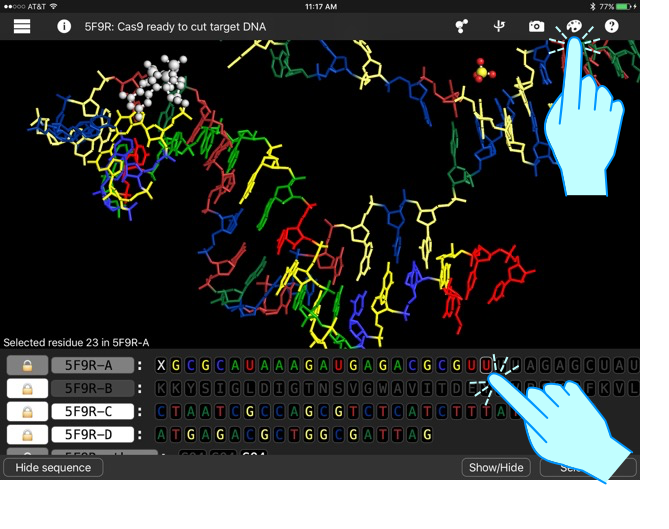 Suggestion - one nice way to view the structure is to select the protein, show all the residues, make it spacefill, and color it neutral. Lock the chains. 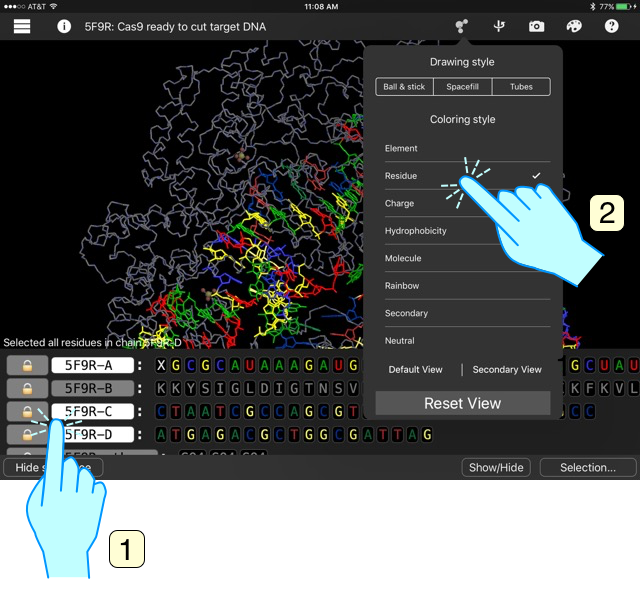 Then select the nucleic acids to highlight them and change the coloring and drawing styles so you can see how they're positioned in the protein. 5. When, you’re done exploring, use Reset View to restore the original drawing and coloring styles. 6. Select the DNA and RNA and apply the residue coloring style. 7. 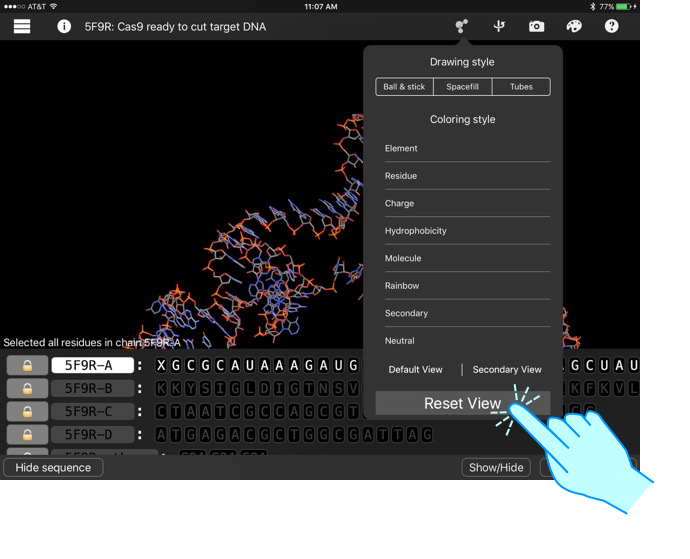 Deselect the DNA, hide the unselected residues, and hide the sequence viewer. 8. Turn the structure around to view it from all angles. Q1. Do you see anything interesting about the structure of the RNA? This is the guide RNA. It has a special shape that's recognized by the Cas protein. 9. Select the DNA and hide everything else. Q2. Where do you think the DNA gets cut? 10. Lock the DNA and protein chains. 11. 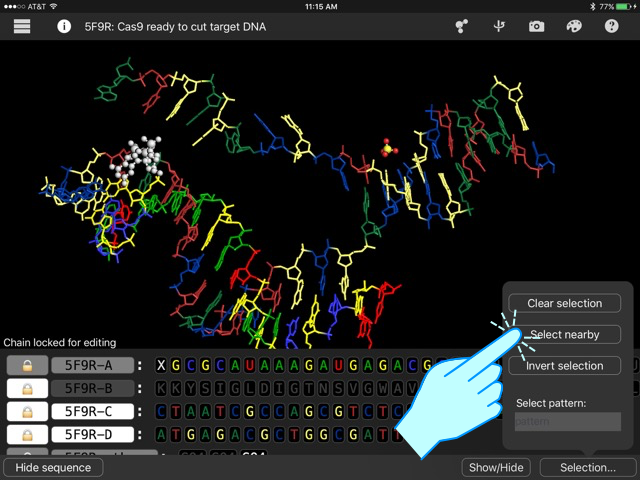 Select nearby residues to see how part of the RNA interacts with the target DNA. Q3. How does the selected part of the RNA interact with the target DNA? 12. Hide the unselected residues. Q4. Now, where do you think the DNA gets cut? 13. Look at the RNA sequence. Select the base on the 3' side of the last highlighted base. (This should be a U). 14. Open the color key. Q5. What kinds of bases are forming pairs? Notice the RNA and DNA sequences are complementary. The GUU sequence is a special motif that helps control where the DNA gets cut. Q6. What part of the RNA sequence would you change if you wanted to cut a different sequence of DNA? Hint: It may help, to unlock the chains and apply Rainbow coloring to identify the 5' and 3' ends of the DNA and RNA molecules.